GIVEAWAYS: Winning WOW! 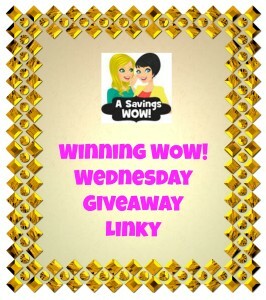 Wednesday Giveaway Linky 08/07/13 | A Savings WOW! Thanks so much for the linky. I tweeted it. Just linked up my giveaway for a Lisa Chan DVD Bible Study on Not of this world. Great video. Thanks for letting me share. Such a great tool! Thank you! Just added a giveaway for a $50 box of spices from The Spice House. Thanks for putting this list together!